What type of leader are you? 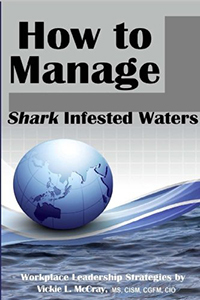 How to Manage Shark Infested Waters provides an array of different leadership styles that can help you recognize your style and the patterns in others. The techniques can also help you choose your style as you move toward advancement and building partnerships whether in office settings or personal journeys. 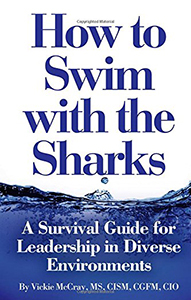 “How to Swim with the Sharks: A Survival Guide for Leadership in Diverse Environments”, provides real-life vignettes of personal and professional triumphs. Each story offers tried and proven leadership techniques for use in challenging business or personal environments. The book also addresses management styles useful for building and managing teams. While the book covers situations in professional environments, it could easily be adapted to situations in community organizations or in school. Unique to business management literature, this book covers a key element often overlooked in other books: office politics. The book is written for those who, despite being highly skilled and qualified, encounter setbacks due to office power dynamics. The book is organized in a very easy-to-read format. Each chapter begins with a dilemma, followed by a strategy, advantage and reflection to help one tackle this dilemma. Then, the chapter concludes with brief “take-away” tips, that will help readers successfully swim with the sharks.